The UC1903 family of quad supply and line monitor integrated circuits will respond to under- and over-voltage conditions on up to four continuously monitored voltage levels. An internal op-amp inverter allows at least one of these levels to be negative. A separate line/switcher sense input is available to provide early warning of line or other power source failures. The fault window adjustment circuit on these devices provides easy programming of under- and over-voltage thresholds. The thresholds, centered around a precision 2.5V reference, have an input hysteresis that scales with the window width for precise, glitch-free operation. A reference output pin allows the sense input fault windows to be scaled independently using simple resistive dividers. The three Open Collector outputs on these devices will sink in excess of 30mA of load current when active. The under- and over-voltage outputs respond after separate, user defined, delays to respective fault conditions. The third output is active during any fault condition including under- and over-voltage, line/switcher faults, and input supply under-voltage. The off state of this output indicates a "power OK" situation. An additional, uncommitted, general purpose op-amp is also included. This op-amp, capable of sourcing 20mA of output current, CAN be used for a number of auxiliary functions including the sensing and amplification of a feed-back error signal when the 2.5V output is used as a system reference. In addition, these ICs are equipped with a start-latch to prevent erroneous under-voltage indications during start-up. 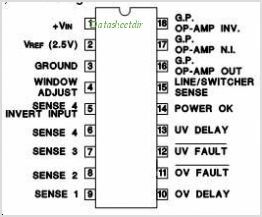 These parts operate over an 8V to 40V input supply range and require a typical stand-by current of only 7mA. This is one package pinout of UC3903,If you need more pinouts please download UC3903's pdf datasheet. UC3903 circuits will be updated soon..., now you can download the pdf datasheet to check the circuits!